Polar Bear Coolers are soft, backpack-like coolers. They come in different sizes and colors to fit a 6 pack, 12 pack, 24 pack or a 48 pack. This type of cooler can keep ice frozen for 24 hours! It can also keep food hot up to 200 degrees for many hours. I love that you can use this for hot and cold. I think that it will be perfect for summer picnics to keep all of my food nice and cold. It will also be great for potlucks to keep something like lasagna hot. It is easy to transport. For my review, I was sent the red 24 pack cooler. 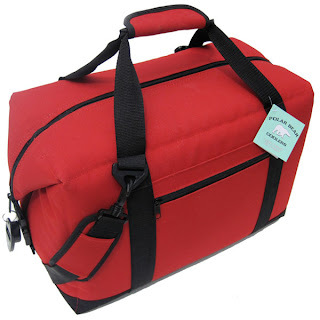 The outside is a heavy duty luggage grade nylon shell. It is leak proof which is great in case you spill something in it. This way, it would not spill all over your car, home or wherever else you have the cooler. The cooler has a shoulder strap to make it easier to carry. I like the thick material which seems to be very durable. This size of cooler retails for $59.95. I look forward to getting a lot of use out of this Polar Bear Cooler this summer! One thing to note about the cooler is after it is packed, you need to buckle down the sides of the cooler; not leave it like it shows in your first photo. This brings together the insulation on the top of the cooler and helps express the air and makes the ice and everything stay cold longer. Looks like a great cooler.